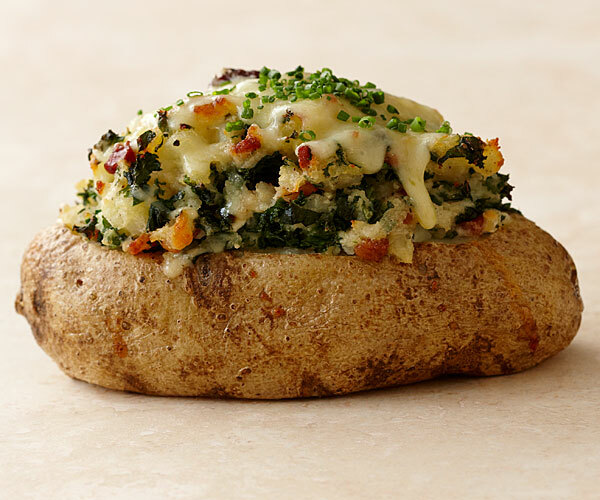 Stuffing baked potatoes with kale or cabbage is a riff on the classic Irish dish colcannon, making these potatoes perfect for St. Patrick’s Day. They’re big enough to be a main dish; make halves (see variation below) if you’d like to serve them as a side. Cook the bacon in a 10-inch skillet over medium heat, stirring, until browned. Add the kale and cook, stirring, until wilted, about 5 minutes. Set aside. Cut a 1/2-inch-thick slice lengthwise off the top of each potato; scrape the flesh from the slices into a large bowl and discard the skins. Spoon the flesh from the potatoes into the bowl, leaving a 1/4-inch shell. Add the butter, 3/4 tsp. salt, and 1/2 tsp. pepper and mix with a potato masher until blended; do not overwork (lumps are OK). Gently fold in the kale mixture, sour cream and half of the cheese with a silicone spatula. Season to taste with more salt and pepper. Bake the potatoes, uncovered, until heated through, 25 to 30 minutes. (To check, insert the blade of a small knife into the center of a potato for 5 seconds; it should be hot.) 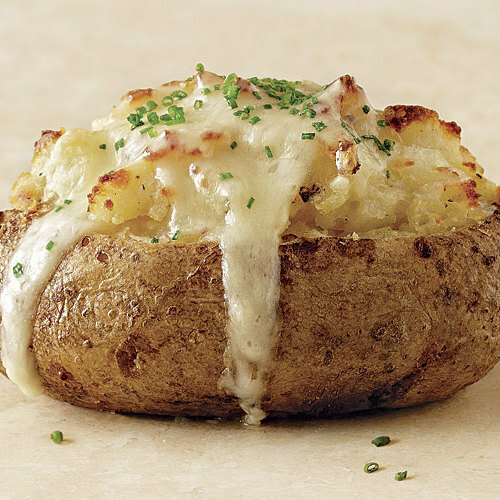 Sprinkle the potatoes with the remaining cheese and bake until the cheese melts and browns lightly in some places, 2 to 3 minutes more. Garnish the potatoes with the chives, let sit 5 to 10 minutes, and serve.